Allied Pest and Wildlife handles animal control, removal and relocation for critters throughout the Portland and Tualatin, OR areas. For 25 years, we’ve deployed humane strategies to trap and remove rats, mice, raccoons, opossums, skunks, bats, birds and more! Plus, we offer insulation services to keep animals out, along with monthly checkup services. Contact us today to have your pest control problem dealt with the right way! We have more than 25 years of experience in dealing with animal removal and are familiar with all of the local varieties of critters in the Tualatin, OR area. All of our animal removal solutions are humane! We believe in environmentally responsible methods for handling nuisance animal problems. We’re a licensed insulation contractor and have our Oregon Construction Contractors Board license (CCB #221952). Our business strives to be an active member of the local community. We’re also part of the Tualatin Chamber of Commerce. The last thing you want to do is share your home with rats and mice or realize a raccoon or opossum infestation somewhere on your property. These critters can cause damage, create health concerns and even pose as threats themselves, which means they need to be removed as quickly as possible. When you need critter control Services in Tualatin, OR, call Allied Pest and Wildlife. We’re the area’s foremost authority on humane pest removal and we’re familiar with all of the local-area animals you may be dealing with. Call us for issues with a full range of small mammals and birds, with the knowledge that we’ll safely and thoroughly remove them from your property. Our experienced team can identify exactly what type of animal you’re dealing with, what the scope of the infestation is, how they’re getting into your home and what needs to be done to remove them safely! Part of our approach to small animal and rodent control in Tualatin, OR is prevention. 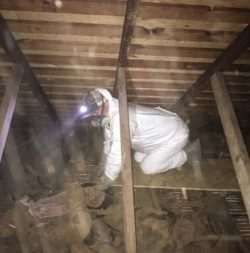 After we remedy the infestation we also take the time to repair and seal any entryways, repair and re-install insulation, and we even provide monthly services to keep any future problems in-check. We’re by your side throughout the process, so you don’t have to deal with anymore headaches from unwanted guests. Give us a call for safe, humane animal removal and all of the prevention services to keep them from coming back. Say Goodbye to Unwanted Guests! If you’ve got rats, mice, squirrels, raccoons or any other unwanted animal houseguests, let us relocate them! We’ll address the problem completely, once and for all, using humane methods. We offer totally free initial inspections and estimates, so you can get an idea of what you’re dealing with and what the scope of work is to remediate it.